It was a hot and well, hot day. I wanted something easy for dinner and decided on hamburgers and sauteed onions. I never feel just a hamburger on the menu is enough, and filled out the menu with corn, pickles and tomatoes. But I still felt I needed a starchy side dish. I rifled through my freezer looking for the bag of fries I always keep there. O.k. I guess it's not always. I quickly remembered the tube of polenta I had picked up at Trader Joe's a few weeks ago. I'd been meaning to experiment with polenta fries and so it went. I have a deep seated fear and general dislike of deep frying, as I feel it makes the whole house smell like a fast food joint, I only do it 2 or 3 times a year. So, I decided to oven fry the polenta "fries". I'm a big oven fryer. It involves putting the food in question, on a very non-stick surface, spritzing with PAM or brushing with oil and baking at a very high temperature, usually 400F degrees or higher. Since polenta is on the bland side, I also coated it with seasoning. Well it worked great and Lillie even gave a "It's Yummy!" Something that's hard to come by with my pint sized critics. I was pleased with how it turned out and there were even calls for seconds. When you have the summer kitchen "blahs" and don't feel like doing much in the way of cooking, try this option. The polenta fries definitely mixed things up, got me out of the kitchen quickly and are quite a bit healthier than regular fries to boot! Spices can be adjusted to your taste. Any spice blend can be used. 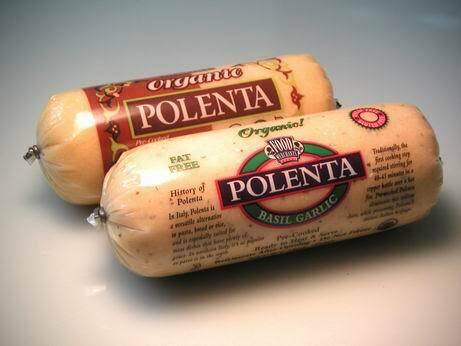 About 1/2 teaspoon per tube of polenta works fine, although with herbs, you should use about 1 1/2 teaspoons. Try Italian, Cajun and Provence herb and spice mixtures. Cut polenta in tube in half or thirds then, then into 3"x1/2" sticks, resembling french fries. Place cut up polenta in a medium sized mixing bowl, and toss with olive oil and seasoning. Spread in a single layer on a non-stick cookie sheet (or use Reynold's Non-Stick Aluminum Foil on any baking sheet). Bake for 15 minutes per side, for a total of 30 minutes, until golden brown and crispy. Serve hot.